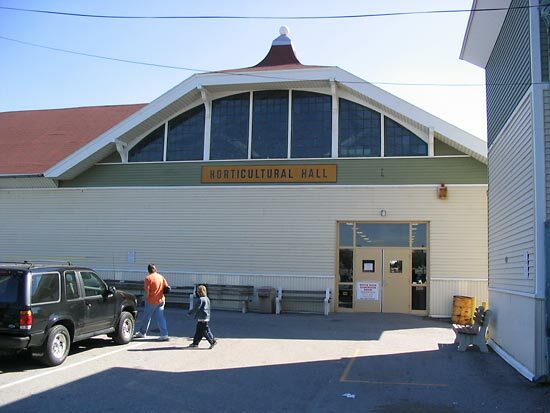 Location: Horticultural Hall, York Fairgrounds, York, Pennsylvania, USA. 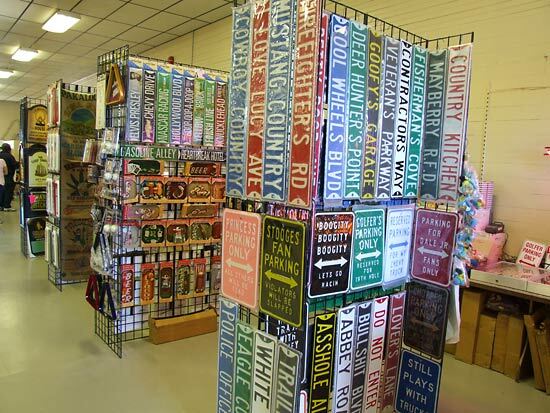 The White Rose Gameroom Show - aka The York Show - is an event that keeps its homely, local feel despite having grown larger than many national shows. 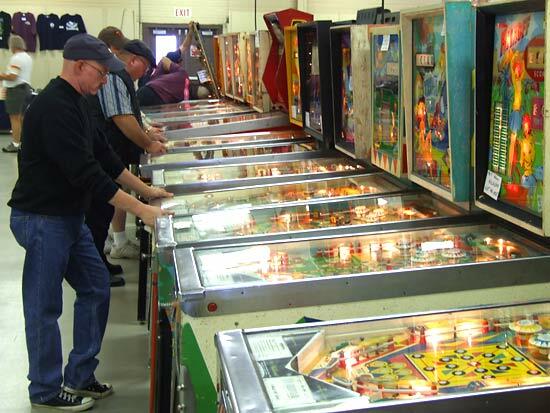 This year proved to be no exception as 159 pinball machines were set up for visitors to enjoy along with 28 video games, 4 bingos, a shuffle alley and a bowler. Pinball News took a break from PAPA to make the four hour drive across Pennsylvania to York County Fairgrounds and the Horticultural hall. Initial signs were good as the car park was already full and overflowing onto the surrounding grass. But before we venture inside the hall, there was the flea market to look at outside which seemed a little larger and busier than usual - possibly aided by the good weather on Friday. On entering the hall and paying the $15 entrance fee, visitors received a raffle ticket which they needed to drop into the organisers' box at the back of the hall to qualify for one of the raffle prizes drawn at intervals throughout both days and posted on a white board. Prizes included t-shirts, mugs and translites. 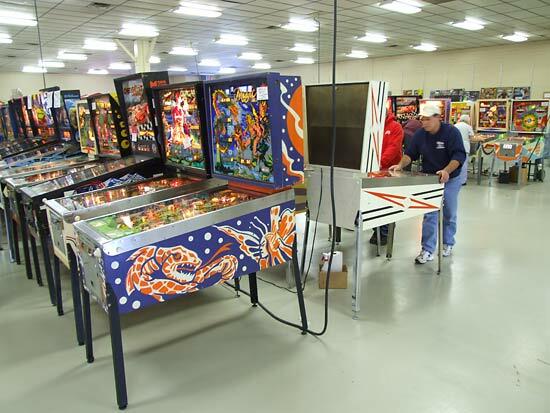 As usual, there was a large number of pinball machines set up in spacious rows and mixed with a smattering of video games, bingos and other amusement machines. 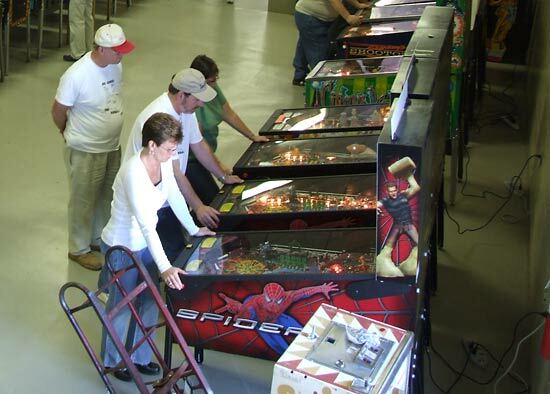 There was a broad range of pinball machines including many EM and early solid state models to complement the newer dot matrix machines including the current production machine Spider-Man. Here's the full list of machines set up by late Friday afternoon - the first day of the show. Later in the day, some of these had been sold and removed but there were further machines expected on Saturday morning, so the numbers should be roughly correct for the second day too. * indicates machine was not working at the time the list was made on Friday afternoon. It may have subsequently been repaired. 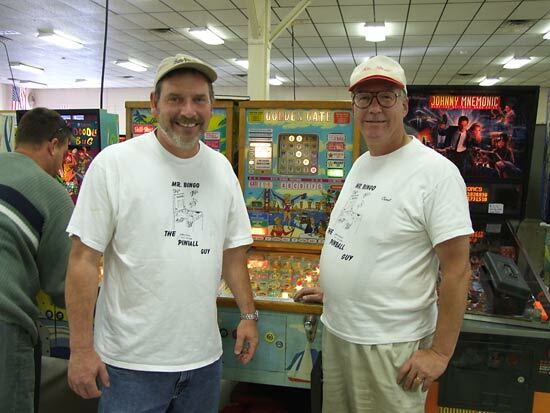 There were two tournaments held on Friday - the Mechanical Pinball Tournament and the Ladies Pinball Tournament. All tournaments were free to enter and limited to one entry per person. The Mechanical Pinball Tournament was played on Bruce Moyer's Gottlieb Snow Derby beginning at 4pm and the result is shown below. On Saturday there were three more tournaments - the Electronic, the Kids and the Doubles. The Doubles started first at midday, played on the same Gottlieb Robo War used for the Ladies Tournament above. The top three were all family teams with the Rumbolds taking first place, the Gardners second and the Ciceros third. The next tournament in the programme at 1pm was the Kids Only event played on Jim Palson's Stars machine by Stern. For this tournament, the top four finishers won prizes. Finally, the Electronic Tournament at 3pm took a slightly different format. It was played on Stern's latest machine - Spider-Man - but instead of just one machine there were two provided by MD's Pinball Palace. 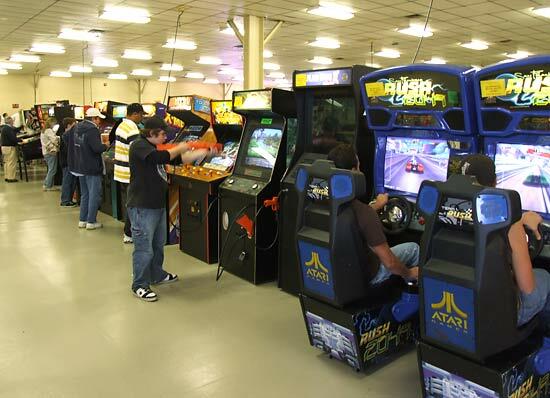 Having two machines meant the queue to play was greatly reduced and more people had the chance to compete. In the end it was Anthony Frasca who came out the winner when the tournament closed. The show closed at 6pm on Saturday when it was time to pack everything away and start the journey home. It was a shame PAPA 10 was on the same weekend as the White Rose Gameroom Show but in truth it was only the semi-serious players who suffered since the two events appeal to different ends of the pinball spectrum. Those who live for the competitive element probably wouldn't find the show in York to their tastes, since the tournaments are a much lesser part of the overall mix than they are used to. 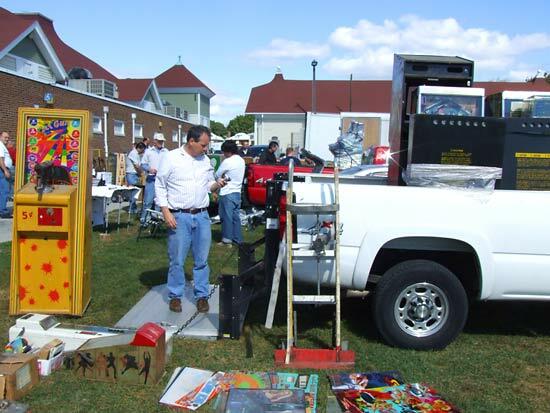 Conversely, the collectors, restorers and enthusiasts wouldn't find too much at PAPA to hold their interest. And in the end, if you were that interested in pinball, the shows were only four hours' drive apart. So another White Rose Gameroom Show had come and gone. 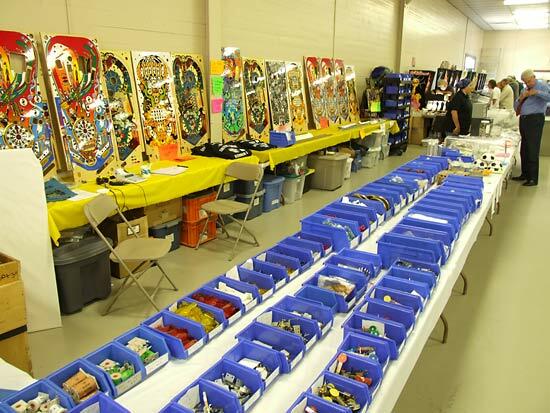 It continues to be a successful mix of interesting games to play, parts and accessories to buy, tournaments to play and the cornucopia that is the flea market. Suggestions for next year would be to reduce the lighting level in the central play area and boost the PA volume or make more frequent announcements about the tournaments and prize draws since it was all too easy to miss them. But congratulations to all involved in the show, especially organisers Marlin Barshinger and Eric Selak for another successful year.